Want to live close to the city but still enjoy the county’s fresh air? Have the best of both worlds and enjoy the calming fresh air of the escarpment’s extensive forest. Enjoy the peace of nature from your own backyard with the breathtaking steep slopes and river valleys surrounded by mature trees along the escarpment and rolling farmlands and rural areas below the escarpment. Take your family to view the beauty of nature on one of the areas trails for a healthy walk along the beauties that make the Niagara Escarpment an UNESCO World Biosphere Preserve. For more property listings in Mulmur, contact Karey today. 40 Somerville Crescent in Mulmur is the perfect home for families looking to enjoy the wonder of the Niagara Escarpment every day. Upon entering this delightful home, you will immediately take notice of the soaring 18’ ceiling that opens to above in the foyer and the tasteful, neutral decor throughout. The bright den space overlooking the front yard is perfect for a home office or cuddling up with a good book. Just down the hall, the welcoming family room with gleaming hardwood floors, a gas fireplace with a rustic chic mantle, and an abundance of windows also opens to the upper level, creating a sophisticated yet cozy essence. The adjoining eat-in kitchen is an entertainer’s dream, equipped with ample cabinet and counter space, tile backsplash, pot lighting, and built-in stainless steel appliances including a refrigerator, dishwasher, stove with a custom hood fan, and a wine refrigerator. The large centre island makes preparing and serving meals a breeze, flowing into the sunny dining space with garden doors transitioning to the large back deck. The expansive backyard also has mature trees and seemingly endless green space, all backing onto quiet open space. 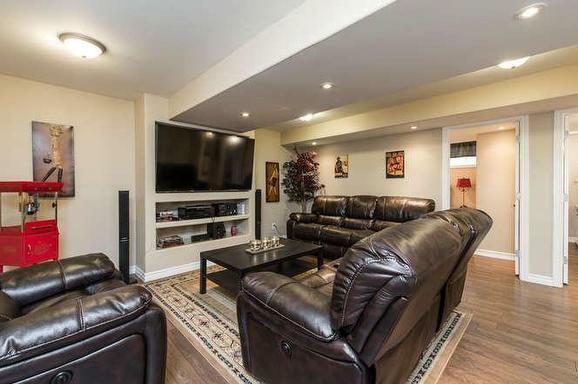 For even more living space, make your way to the equally impressive finished basement. This fabulous lower level has an airy feel, thanks to the pot lighting, above grade windows, and high-quality carpeting. A family room, 4-piece washroom, two bedrooms, and an office space are all on this floor, great for extended family visits or an in-law suite! Fun Family Events at Snowman Mania Weekend! For more information about the great town of Alliston contact me today! Family-friendly activities like Snowman Mania are always going on in Alliston. Combined with its convenient location and serene setting, this beautiful area is the perfect place to call home! If you're in the market for a low-maintenance, meticulously maintained property, look no further than 30 Hoard Avenue. 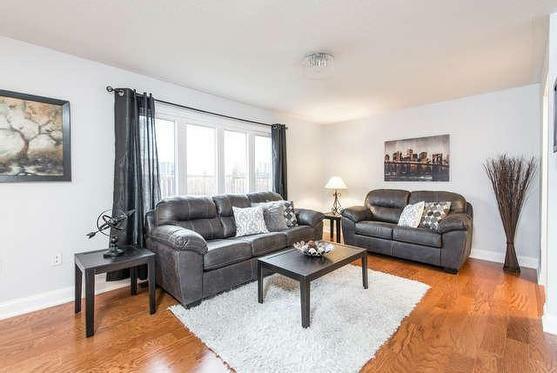 Open and bright, this beautiful 3 bedroom semi-detached property with a beautiful interlock front walk and pretty landscaped yard is the perfect place to call home! With approximately 1,500 square feet of living space plus a full finished basement, this delightful residence is on a quiet street in the highly desirable Alliston "Treetop" Community. As you enter this airy open concept home, you will immediately be drawn to the spacious living and dining areas with a cozy, welcoming feel. The living room features high-end laminate flooring and a large window with California shutters overlooking the backyard and green space beyond. Enjoy meals in the stylish dining space, or step through the garden door to the back deck to sip your morning coffee on warmer days. The fabulous backyard is fenced in with lots of green space, great for entertaining or relaxing in privacy while watching the sunset over the pond. The adjoining updated kitchen comes equipped with ample cabinet and counter space, tile backsplash, and appliances including a refrigerator, stove, and built-in dishwasher. On the upper level, you will find the large Master bedroom, 2 additional sizable bedrooms, the main full 4-piece washroom, and the convenient laundry room. Furthermore, 30 Hoard Avenue has a finished basement with a workshop, a bright family room with above grade windows, plus plenty of storage space. With a tasteful neutral decor and functional layout in a peaceful neighbourhood, this move-in-ready home won’t be on the market for long! Getting ready for Halloween this weekend? The Humber Bay Library in Etobicoke is offering a free workshop dedicated to making Halloween themed crafts on Thursday, October 19th. Stop in with the kids at 5 PM for some arts and crafts time to get their creative minds and hands working; all crafts are free to take home for you to hang up around the house in time for the big day. For more information about this workshop and other activities you can take part in, visit the Humber Bay Library page here. If you're looking to live conveniently located near Toronto, Etobicoke could be your next home. A quick drive down the Gardiner, Etobicoke is convenient for commuters and chock full of things to do for homebodies like the free Halloween Crafts at the Humber Bay Library. 18 Bradshaw Avenue is an example of a home in the area with enough space for a growing family. Nestled on a gorgeous tree lined street on a 50’ x 105.5’ lot, this beautiful 3+1 bedroom property is the perfect place to call home! The welcoming exterior features landscaped gardens and a long private driveway leading to the garage. As you enter this fabulous home, you will immediately take notice of the fantastic open concept layout that offers plenty of versatility. The bright living and dining area features beautiful hardwood floors, crown moulding, built-in shelving, and large windows that allow an abundance of natural light to fill the space. The family-sized kitchen is equipped with ample cabinet and counter space. Also on the main level are 3 good sized bedrooms, and the main 4-piece washroom. Furthermore, 18 Bradshaw Avenue has a finished basement with a separate entrance, recreation room, bar, bedroom/office, 2-piece washroom, and the laundry room with a shower. With endless potential and a functional layout, this property won’t be on the market long! The Nottawasaga Handweavers and Spinners Guild will be meeting at The Gibson Centre in Alliston on Thursday, October 5th to share ideas and teach skills in the fibre arts from spinning, weaving, dyeing, and more. All are welcome to attend regardless of skill level or progress. Bring in anything from ideas to a work in progress to a finished piece to discuss or receive assistance with your next project. New crafters are welcome to attend to learn about the art from more those with more experience. Alliston is a great place for those who are looking for a place to call home. If you're looking for a town with plenty of support and activities for people who love working with their hands like the Handweavers and Spinners Guild, 156 Nelson Street West could be the perfect home for you. Embrace the spirit of do-it-yourself with this cozy home on a quiet street in a desirable Alliston neighbourhood. This charming home features bright and large rooms with plenty of potential for the savvy investor or creative home buyer. The living and dining areas are perfect for entertaining, with an airy feel from the open concept design that allows for comfort and flexibility. This home has original strip hardwood flooring, as well as large windows that let in plenty of sunlight, some of which have been recently updated. 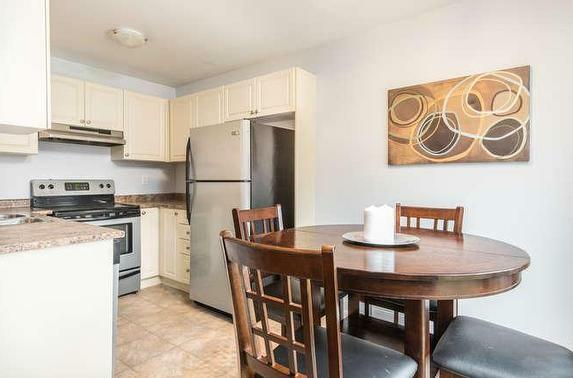 The roomy kitchen is functional with a large pantry, lots of cabinet space and name brand appliances. The large fenced backyard has lush green space and mature trees. On the second level you will find the master bedroom with wood flooring. The 2 additional bedrooms are also sizeable and well laid out. There is also a main 4-piece bathroom on the upper level. The home’s large unfinished yet clean basement could be finished to suit your taste. The furnace has been recently updated. Perfect for growing families or retirees alike; 156 Nelson Street West has a beautiful shell offering incredible value. If you are looking for a home or for any of your real estate needs, contact me today! The Angus Farmer's Market is coming back to town on Thursday, July 20th from 4 PM until 8 PM. Come on out to meet the community as well as local artisans and musicians. The stalls will be lined with fresh produce and local goods in classic small-town farmer's market style. Buy anything from fresh fruits and veggies to baked goods and home goods from the entrepreneurs from around Angus in Essa. If you're thinking about relocating, Angus is a great choice if you're looking for smaller town living. A great example of a family home in the area is 112 Cecil Street. This striking brick-faced 3 bedroom home makes quite the first impression! A lush front yard with landscaped gardens and a mature tree for shade line the driveway leading to the 2 car garage, with an adjoining interlocking stone walkway guiding you towards the front door. 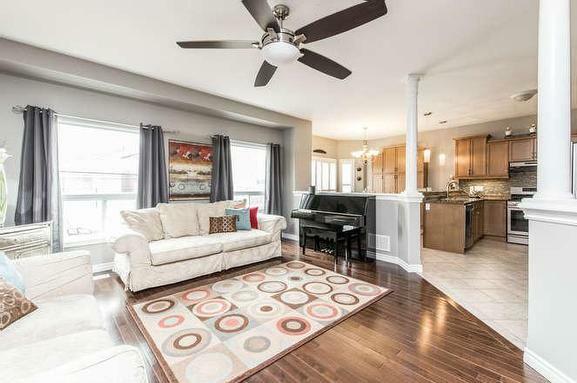 As you step into this bright family home, make your way to the open concept living and dining room just off the foyer. Detailed with beautiful laminate floors, large windows, and a brick fireplace, this principle room has a warm, inviting essence. The eat-in kitchen features plenty of cabinet and counter space, as well as quality appliances including a built-in dishwasher, stove, and refrigerator. The sunny breakfast area is great for quick morning meals, or step out the sliding glass doors to enjoy your refreshments on the deck overlooking the pool-sized backyard with mature trees. On the upper level, you will find the large Master bedroom with a walk-in closet, as well as 2 additional bedrooms, and the main 4-piece washroom. This home also has an expansive unfinished basement that the new owner could customize to suit their needs. With a functional layout and endless potential, any family will love making memories in this home! Learn to Make Your Own Felted Soap! If you love cuddly, furry alpacas and the amazing things they provide for us, you'll want to sign up for the workshop presented by Forget-Me-Not Alpacas and the Mount Albert Knitting Guild in which you'll get to make your own felted soap out of alpaca fleece. The event will take place on Saturday, June 24th at 11am at the East Gwillumbury Public Library. Bring your own soap to create something truly unique! It costs $5 to register, so make sure to do that fast! Felted soap is an uncommon thing to see in stores, but is a great way to cleanse. The felted fleece acts as a soft loofah to gently exfoliate while the fibres are naturally antibacterial, which helps keep away odour bacteria even after you step out of the shower. Felted soap is usually local and always cruelty free; the proceeds go towards feeding, cleaning and otherwise keeping those adorable alpacas happy and healthy. For more information about the alpacas from Forget-Me-Not Alpacas, visit their website here. Community events like this fun soap workshop are always in the Mount Albert calendar. If you're looking for a change of scenery, consider 173 Mainprize Crescent, a great example of the kind of homes in the area. With lots of charm and quality finishes, this 3 bedroom property is the perfect place to call home! The beautiful, inviting exterior is detailed with gorgeous millwork on the porch, a fenced in yard, and a private driveway leading up to the single car garage. As you enter this bright family home, you’ll notice the fabulous open concept layout of the living and dining area that is ideal for entertaining or unwinding alike, with lovely large windows that allow an abundance of natural light to fill the room. The adjoining kitchen features ample cabinet space, quality appliances including a refrigerator, stove, and built-in dishwasher, and an island/ breakfast bar that is great for morning meals and conversation. On warm summer days, step out to your stone patio via the convenient sliding door in the dining area to grill or savour your meals outdoors. The fenced in backyard also has plenty of room for a garden, hot tub, or anything else you desire! On the upper level, you will find the Master bedroom with a large closet and a semi-ensuite washroom, as well as two additional bedrooms with one also featuring a walk-out to a balcony. Furthermore, this home has a clean, unfinished basement that the new owner could finish to suit their needs. With a fantastic layout and endless potential, this home will suit any family. This Friday, May 19th is Cocktails and Classics at the Gibson Centre's Mercer Pub in Alliston. A hallmark of Canadian history, the Gibson Centre is host to many community and cultural events like Cocktails and Classics. For a $20 entry fee, you can enjoy cocktail food and drinks and musical classics from the ages for everyone to sing along to. The event starts at 8:00 PM and will take place until 12 AM in what will be a fun, music-filled night. 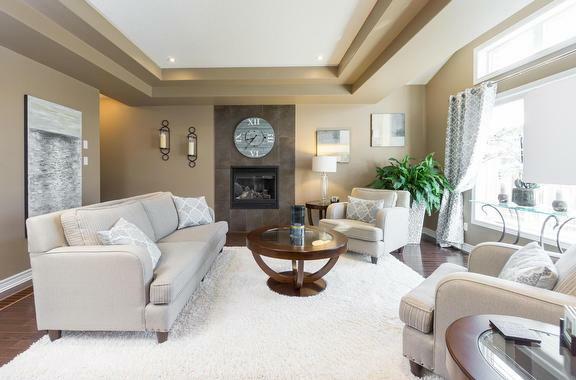 Alliston is a great place to move to if you're looking for a new place to call home near community activities like Cocktails and Classics. 5 Oak Street is a home that is a great example of the kind of family home you can find in the neighbourhood that recently sold. This charming 3+1 bedroom bungalow in an established Alliston neighbourhood is the perfect place to call home! The well kept exterior features mature shrubbery, an interlocking stone walkway, and a large private driveway leading to the attached single car garage. 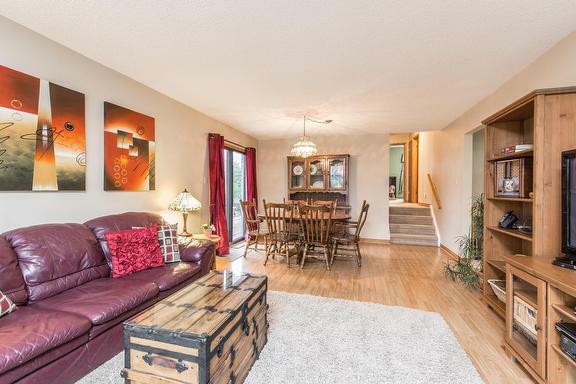 As you enter this delightful family home, make your way to the spacious open concept living and dining room with a fireplace and brick surround, as well as a sliding door walk-out to the back deck and sizable fenced-in yard, sure to be enjoyed on warm summer days. 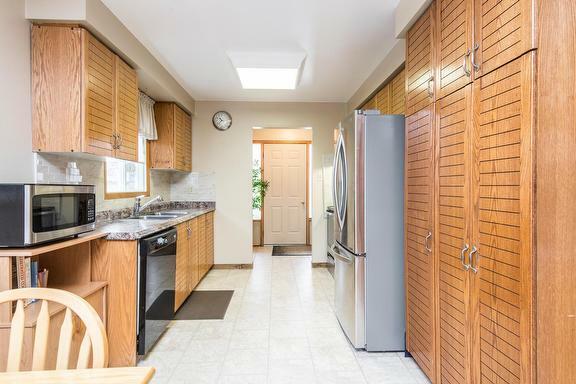 The eat-in kitchen comes equipped with plenty of storage space in the cabinets, as well as ample counter space for cooking, laminate flooring, and appliances including a refrigerator and stove. Also on the main level is the Master bedroom with a large closet and a 4-piece semi-ensuite washroom. The 2 additional bedrooms on this level include large windows that allow for an abundance of natural light, as well as quality carpeting throughout. Furthermore, this home has an expansive finished basement with a large family room, 2nd kitchen that is sure to be appreciated during the holidays, another bedroom, and a 4-piece washroom. There is also an office/workspace on this level, as well as the laundry room. 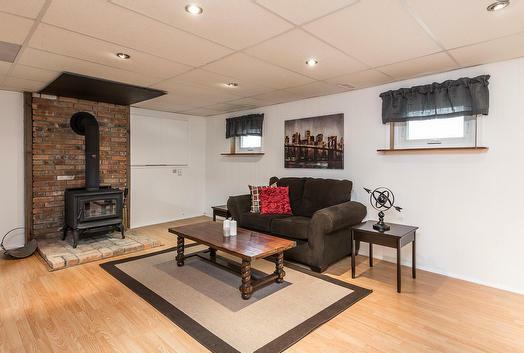 With a functional layout and tons of potential in a great Alliston location, this bungalow will suit any family! Have A Spot of Tea For Canada's 150th Anniversary! This coming Sunday, May 7th will be the date for the 54+ Seniors of Alliston Club's public Victorian Tea. The event is free for the public to attend and will consist of tea, tiny sandwiches and sweets as a celebration of Canada's 150th anniversary. Taking place from 1pm-3pm at the New Tecumseth Recreation Complex, feel free to dress up for classic teatime. The sense of community is strong in Alliston. If you're looking to move to a place where there are plenty of community events, Alliston could be the right choice for you. Take a look at 195 Shephard Avenue, a perfect example of the kind of family homes you'll find. 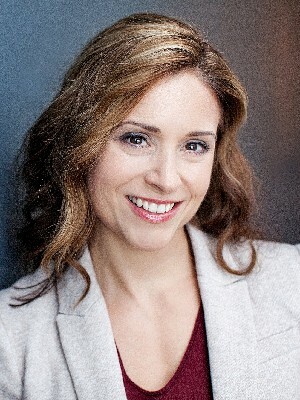 To learn more about Alliston properties, contact Karey today! 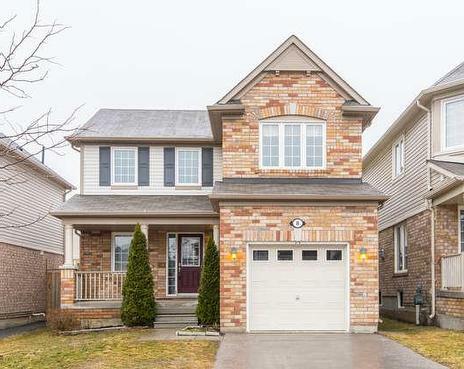 Nestled in an established Alliston neighbourhood, this fabulous 3 bedroom home has everything you’ve been searching for! The charming exterior has a vintage essence, with detailed trimming, a pretty front porch, and a carriage style garage door. Upon entering this lovely modern home, you will be drawn to the airy open concept living and dining area, accented with 9’ ceilings, high-end laminate floors, and large windows that allow sunlight fill the space. 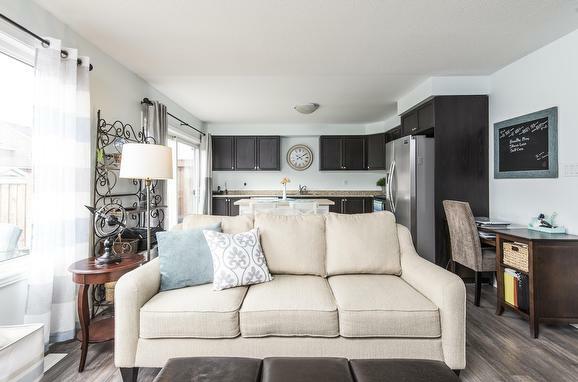 The living room opens to the bright updated kitchen, equipped with ample cabinet and counter space, a large centre island, and stainless steel appliances including a refrigerator, stove, microwave, and dishwasher. The sliding door walkout to the large two tier deck makes it simple to dine outside or host summer parties. The beautiful fenced in backyard also includes plenty of green space, raised garden beds, and a shed for storage. 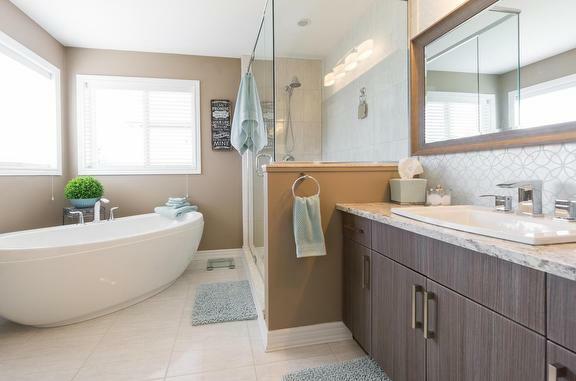 Make your way upstairs to the large Master Suite, featuring his and hers walk-in closets and 4-piece ensuite with an extra wide soaker tub. There are 2 additional good sized bedrooms on this level, as well as the main full washroom. This home also has a clean, unfinished basement that the new owner could finish to suit their needs with a 3 piece rough-in for future a washroom, and washer and dryer. With a functional layout and modern upgrades, this home will suit any family! The Gibson Centre in Alliston will be showing Maudie, a critically acclaimed biopic about one of Canada's most renowned folk artists Maud Lewis. With seven awards from the Atlantic Film Festival, Canadian Society of Cinematographers Awards and more, Maudie will be shown as a part of Toronto International Film Festival's Film on Screen celebration of 150 years of Canadian cinema history. The screening will be on Sunday, April 30th from 2-4pm, so don't miss out! The Gibson Centre has been a hallmark of Canadian Culture since its construction in the 1880s. If you're looking for a home in a place with rich history like Alliston, look no further than 49 Burt Avenue. Situated in a great Alliston neighbourhood with 3 bedrooms and upscale finishes throughout, this fabulous modern home has everything you’ve been searching for! Upon arrival, the landscaped gardens and an interlocking stone walkway guide to the covered front porch. As you step through the front door, you will notice the sizable office space off the foyer, featuring 9’ ceilings, hardwood floors, and large picture windows. Just down the hall, the spacious open concept kitchen/living/dining room area is an entertainer’s dream! The great room has the same quality finishes as the office, as well as a tray ceiling with pot lights and a flush mount fireplace with a slate front for a cozy yet sophisticated atmosphere. The dining area is ideal for enjoying home cooked meals and conversation while overlooking the backyard, or step out on warm summer nights to the deck. The fenced in backyard also has an interlocking patio and stone steps, plus plenty of greenspace for a garden. 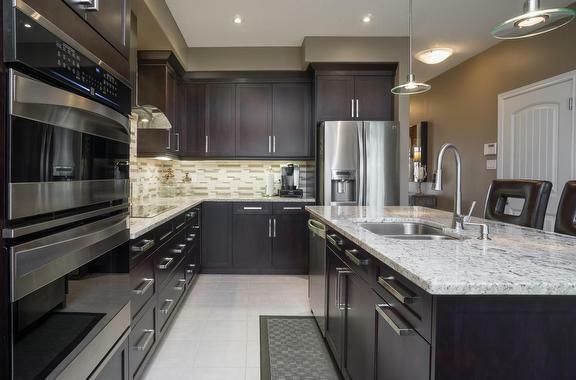 The adjoining gourmet kitchen is sure to please the chef of the household, with beautiful granite countertops and designer tile backsplash, a large custom centre island, and high-end stainless steel appliances including two wall ovens, a refrigerator, dishwasher, and a range hood. Make your way to the upper level, where you will find the airy Master Suite with a large walk-in closet and a spa-like ensuite with a stand up glass shower and a separate soaker tub; perfect for relaxing in after a long day at work. There are 2 additional bedrooms on this level, as well as a modern 4-piece washroom and a laundry room for added convenience. On the lower level is even more living space, with a tastefully finished basement featuring a recreation room with a second flush mount fireplace, a 3-piece washroom, and above-ground windows for natural light. Extras includes custom blinds throughout, an optional bump-out in the great room for more space, home access from the car and a half garage, and a main floor powder room. With all of these incredible features and a fantastic layout, this home won’t be on the market long! As you enter this fabulous open concept home, you will immediately notice the highly functional layout that makes this property perfect for families! Just off the foyer, the spacious open concept living and dining room is airy and cozy, with large windows, beautiful laminate floors, and a sliding glass door to the back deck. In addition to the spacious deck, the lovely fenced-in backyard also has as plenty of green space and mature trees for shade- perfect for entertaining in the warmer months. The adjacent kitchen comes equipped with updated laminate countertops, large kitchen cabinets, and quality appliances, plus a bright breakfast area to enjoy morning meals. 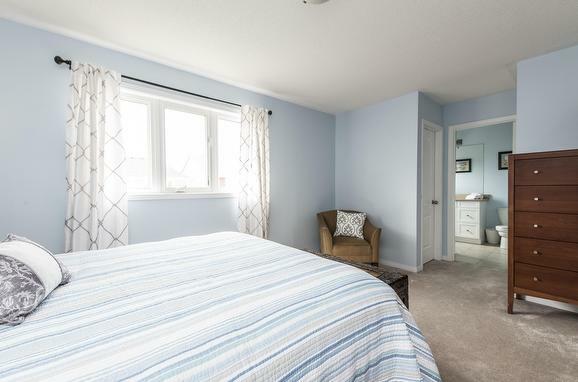 On the upper level you will find the sizable Master bedroom with two closets, as well as two additional bedrooms and an updated 3-piece washroom. This fantastic home also has a finished basement with a rec room featuring a gas fireplace, a washroom, a fourth bedroom, and an additional room that is currently being used as a workspace, with above ground windows and high ceilings throughout. With a fantastic layout in a wonderful location, this home will be the true pride of ownership of any family! Basements have come a long way since the days of wood paneling and shag carpet. A well-finished modern basement is warm, inviting, and just as beautiful as the home’s main floor. Anyone who grew up with a basement knows how nice it can be to cuddle up with your family in the basement to watch a movie or play games. It also doubles as a great entertainment area. 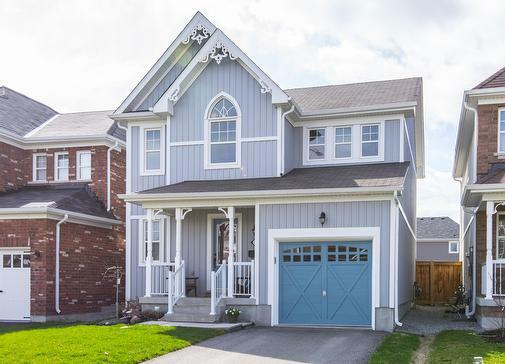 If you are looking for a home with a finished basement or one you can customize to suit your needs, then read about this beautiful home at 141 Gray Avenue in Alliston that I recently sold. This fabulous modern residence built by Devonleigh Homes features enticing curb appeal, with high-end brick and vinyl siding, landscaped gardens, a charming front porch, and a well kept driveway leading to the double car garage. Step through the decorative front door into the airy foyer, with high ceilings that open up to the second level. Just off the foyer, the spacious living and dining room areas are perfect for entertaining or unwinding alike, accented with gorgeous hardwood floors, 9’ California knock down ceilings, and large picture windows that flood the main level with soft, natural light, with the dining room also featuring double French doors for an extra touch of sophistication. The beautiful updated eat-in kitchen comes equipped with ample cabinet space and premium stainless steel appliances including a Samsung refrigerator, a wall oven and built-in microwave, a gas stove, and a dishwasher. The well placed walk-out to the backyard from the kitchen makes it easy to enjoy meals outdoors on warm summer nights. Furthermore, this fantastic home also has a lovely professionally finished basement with a spacious family room featuring a built-in entertainment unit, 1 bedroom, a spa-like 3 piece washroom, and a den with quality laminate floors throughout, plus a bonus room roughed-in for a 2nd kitchen complete with electrical and water. 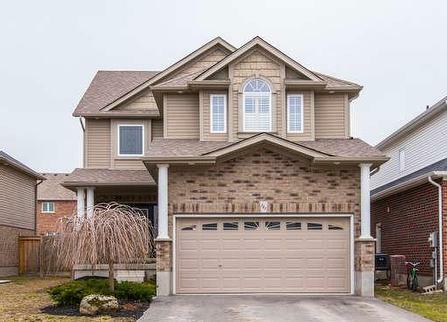 With all these upgrades in a great Alliston location, this home is perfect for any family! Values change as we grow older. When we are young, we want to live in the vibrant city centres; near friends, bars, public transportation and nightlife. Add a spouse and children to the mix and suddenly we want a safe neighbourhood, to own your own place, good schools, other children in the neighbourhood, and like-minded neighbours raising kids of their own. Most of us understand the concept of a family-friendly neighborhood, but how do you go about finding this location? As an experienced and trusted realtor, I know how advantageous and rewarding raising a family in Alliston can be. If you are looking for a property like 8 Davidson Drive below, I welcome your calls. Featuring a multicolored brick exterior, landscaped gardens, and a single car garage, plus a pretty front porch with tons of potential, this lovely Mattamy residence sits on a quiet street in a great location, with a brand new school within walking distance, as well as plenty of green space and the Boyne River nearby. As you step through the front door, you will notice the fantastic open layout of the principle rooms, as well as the wonderful finishes throughout, including new paint and trim. The inviting living area is ideal for entertaining and unwinding alike, featuring brand new hardwood floors and large picture windows that flood the space with soft, natural light, as well as an adjoining powder room for convenience. The adjacent dining area is great for enjoying home cooked meals, or step outside to your fenced-in backyard to savor refreshments during the warm summer months. The updated kitchen features laminate countertops, ample cabinet space, and quality appliances including a stainless steel refrigerator, stove, and built-in dishwasher. Contact me, for all of your real estate needs! Laminate is an affordable alternative to hardwood, but that doesn't mean that you have to sacrifice the integrity of the room to reflect that. Laminate can look as nice as hardwood if you frame the room around it. To learn more about different flooring, contact Karey today! A dark laminate can feel mature and modern paired with stainless steel accents like light shades or furniture. A light laminate can emulate the feel of an airy Scandinavian abode when paired with white or cream walls and bright furniture. Look at the use of laminate in 29 Jamieson Drive, Rosemont and see how bright a room can be through the use of light laminate and off-white walls. You’ll feel right at home in this lovely 3 bedroom property! With brick and aluminum sided exterior, a pretty yard, and an oversized 1 car garage, this delightful residence is on a quiet street in a desirable Rosemont neighbourhood. As you enter this fabulous flowing concept home, you will immediately take notice of the quality laminate flooring that is carried throughout the main level. The spacious living and dining room areas are perfect for entertaining or unwinding alike, featuring a picture window that provides the home with soft, natural light. The bright kitchen includes ample cabinet space and plenty of room for your premium appliances, as well as a large window with a view of the backyard. The sizable backyard is fenced in with lots of green space, great for entertaining or relaxing in privacy. As you continue to make your way through the home, you will find the bright Master bedroom, as well as 2 additional bedrooms with ample closet space and lots of natural light. This home also has a third level including a rec room with a wood stove, pot lighting, large above-grade windows, and a huge crawl space for storage. There is a 3-piece rough in for a future bathroom that the new owner could finish to suit their needs, and a laundry room. Extras include a washer and dryer, and a newer furnace, windows and doors, attic insulation, 200 amp panel, and water softener. With a modern decor and a functional layout, this home will suit any family. To watch a video tour of this property, click here. For more property listings in Mulmur, contact Karey Salem today. How to find a Home with Character at a Reasonable Price! For those who appreciate the beauty of classic architecture, finding an affordable home in Toronto can be exceptionally difficult. These coveted properties are often only available to a select few, and even at their high prices, they generally sell very quickly! This has inspired home buyers to expand their search to surrounding areas, where Victorian homes are equally impressive and command a more reasonable price. To learn more about historic homes for sale in Ontario, contact Karey today. If you're in the market for a charming home with classic details offering incredible value, look no further than 172 Queen Street West in Mount Forest! A rare gem in a convenient location, this unique property has everything you've been searching for. This remarkable 3 bedroom century home is the perfect mix of historic charm and modern design! Lovely English gardens adorn the front of the residence, guiding you to the covered front porch. The adjoining concrete driveway leads to the board and batten garage/workshop with a wood-burning heater, passing another covered porch along the way. Upon entering this delightful Mount Forest home, you will immediately take notice of the classic finishes throughout, including the original hardwood floors, crown moulding, and airy 12’ ceilings. 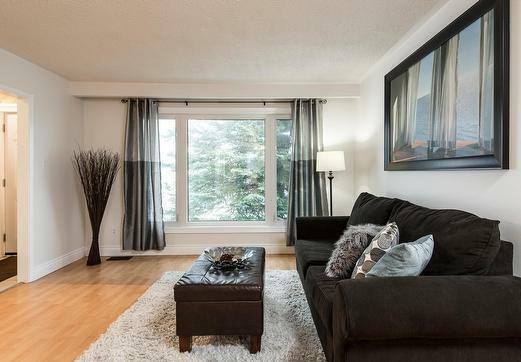 The spacious living room is bright and welcoming, featuring large windows and a stylish modern light fixture. Just across the hall, the main floor laundry area flows into the gorgeous chef’s kitchen, equipped with ample cabinet and counter space, pot lighting, built-in appliances, and a large centre island/breakfast bar. The sunny dining area is perfect for enjoying home cooked meals, or step through the double doors to your private yard. Landscaped with rhubarb and raspberry bushes, Maple and Oak trees, and perennial flowers, this mature garden requires little care to maintain its beauty. This lush outdoor space also has two seating areas, one on the stone patio with a BBQ area, and the other on the deck with plenty of room for a gazebo or pergola. 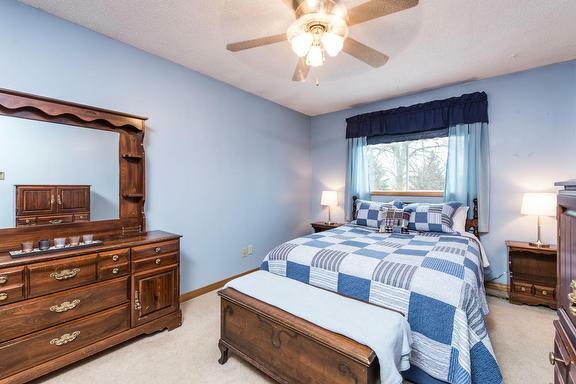 Also on the main level are two sizable bedrooms, as well as a third room that could be used as another bedroom, den, or anything else you desire! To learn more about this Mount Forest property, click here.